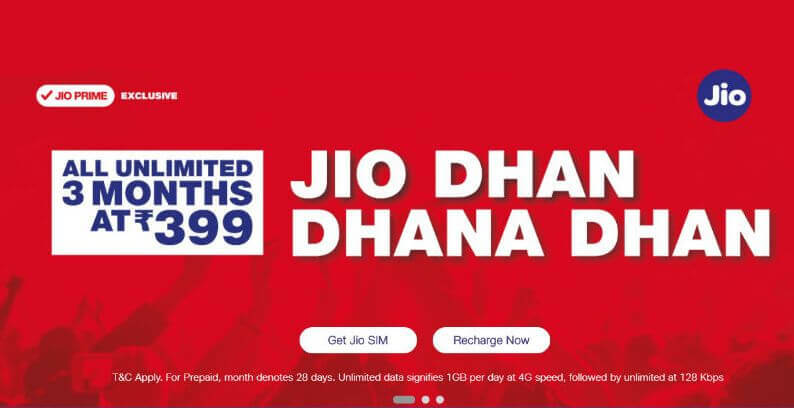 Reliance Jio has extended its Jio Dhan Dhana Dhan offer with the new Rs. 399 pack, continuing the low-cost services for another three months. Reliance Jio has now become the most popular telecom operator in India with 109+ million subscribers and still counting. Jio has started their journey with Jio Welcome Offer in which they offered free 4G services along with unlimited calling for three months and then extend upto 3 more months and now when their previous plan coming to end, they once again came with lucrative Jio Plan. Although Jio has not announced the plans formally, these plans have already been put up on their website. The New plans come with more offerings and tweaked data as per the choice of users. The minimum price is Rs. 19 with 200MB data that is valid for 1 day and Rs 9999 is the maximum one with 780GB Data valid for 390 days. In these given data plans only 399 plan looks beneficial for Jio users offers exactly the same benefits as current Rs. 309 plan. As usually, Jio customers are using Prepaid, but here are post-paid tariff plans. The minimum plan starts from Rs. 309 valid for 2 months with 6GB data and 1GB cap per day. Then there is Rs. 999 plan valid for 2 months, with 90GB data. If you are wondering about how to check your existing plans or its end date, then no worry just use the My Jio app, then go to top left corner and then tap on the top that says “My Plan” Details. In that you will see your plan details and the upcoming Jio plans if any that you had already subscribed.